Dimensions 2 by 9.50 by 12.25 in. Amazon.com description: Product Description: This is the 6th of the multi-volume series designed to provide the first comprehensive account of all the species of birds in the world. 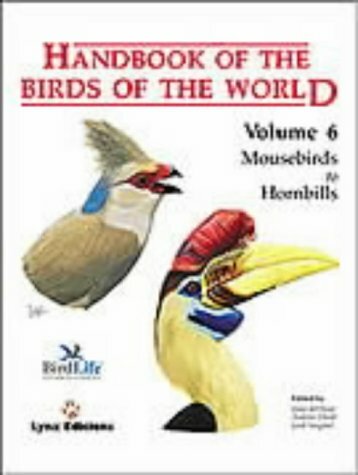 This volume covers from Mousebirds to Hornbills. Each chapter, headed by a summary box, deals with a different family, and it is subdivided into sections: systematics; morphological aspects; habitat; general habits; voice; food and feeding; breeding; movements; relationship with man; status and conservation; a general bibliography and detailed species accounts. The species accounts include names in French, German and Spanish, in addition to scientific and English names. Each species features taxonomic notes; subspecies and distribution; habitat; food and feeding; breeding; movements; status and conservation and a selected bibliography. About: This is the 6th of the multi-volume series designed to provide the first comprehensive account of all the species of birds in the world.